Considered among the greatest painters of all time, Vincent Van Gogh was a Post-Impressionist artist of Dutch origins. His work, which is notable for its rough beauty, emotional honesty, and bold color, had a deep and profound impact on 20th century art. Here are 10 of his most famous paintings from The Potato Eaters (1885) to Portrait of Dr. Gachet, which he painted a few months before his death in July 1890. In early 1890, Van Gogh’s brother Theo had a son who was named Vincent after the artist. Van Gogh was attached to the baby and wrote to his sister-in-law Jo, “He always looks with very great interest at Uncle Vincent’s paintings.” This painting was created by Van Gogh to celebrate the birth of his nephew. Vincent was a fan of Japanese art especially of the woodblock print genre Ukiyo-e and influence of Ukiyo-e can be seen in this famous work which was held in high esteem by the artist. Wheatfield with Cypresses is the title of three paintings by Van Gogh which are very similar in composition. The above painting is the first of the three and was completed in July 1889. 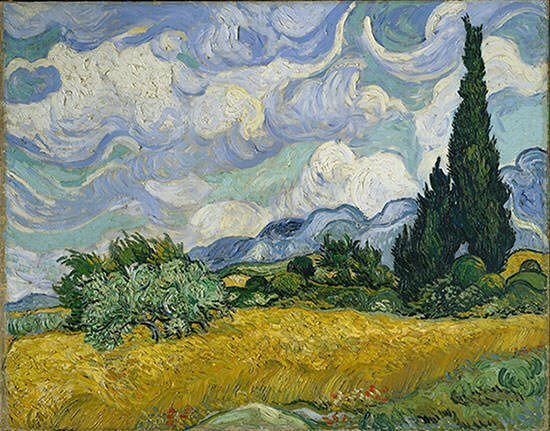 Van Gogh, who had a fondness for cypresses and wheat fields, regarded the painting as one of his best landscape paintings and hence went on to create two more similar works. The above painting is the one which is present at the Metropolitan Museum of Art in New York City. 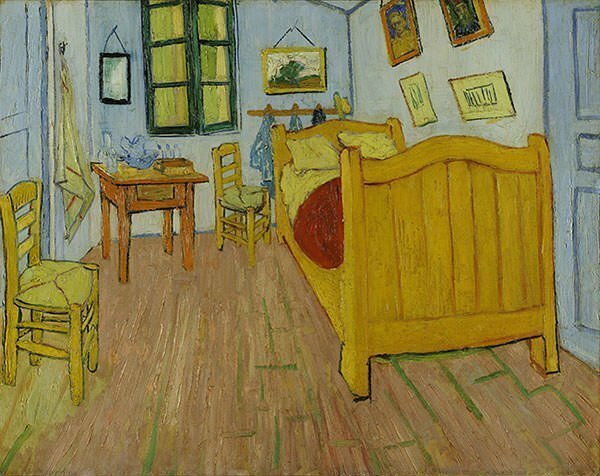 This painting is the first version of three similar paintings which are referred to as Bedroom in Arles and were simply titled The Bedroom by Vincent. The three paintings can be differentiated by the pictures hanging on the wall to the right. This version has miniatures of Van Gogh’s portraits of his friends Eugene Boch and Paul-Eugene Milliet on the right wall in the painting. The subject of the painting is Van Gogh’s bedroom at 2, Place Lamartine in Arles, Bouches-du-Rhone, France, famous as his Yellow House. 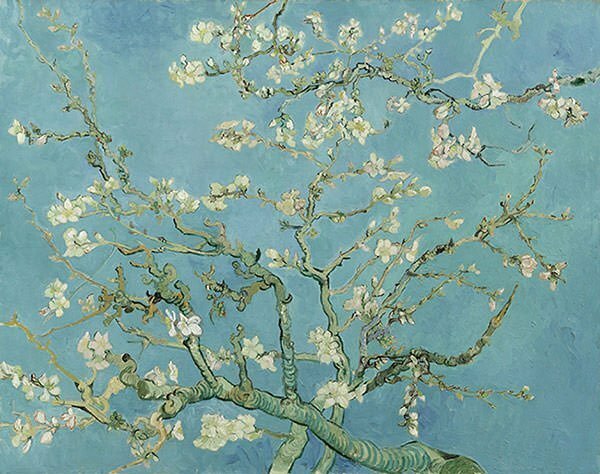 This painting was Van Gogh’s first major work. He wanted to portray the peasants as realistically as possible and deliberately chose coarse models for the work that would seem to “have tilled the earth themselves with these hands they are putting in the dish”. 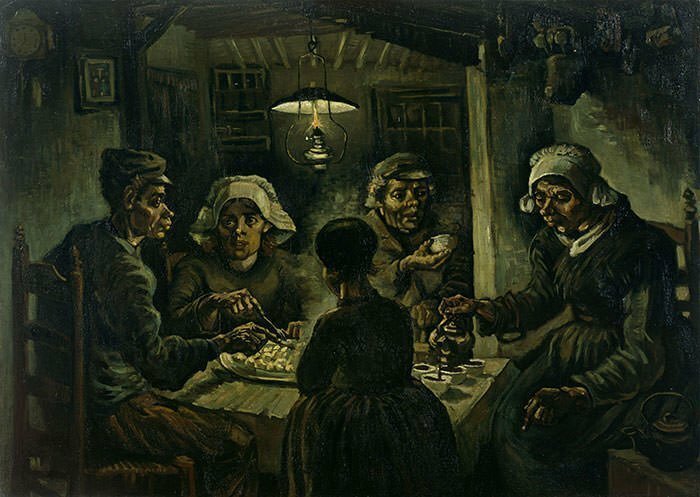 After two years and numerous paintings, Van Gogh still considered The Potato Eaters as his best work and he wrote to his sister, “What I think about my own work is that the painting of the peasants eating potatoes that I did in Nuenen is after all the best thing I did”. Vincent van Gogh is famous for his self-portraits. He painted over 30 of them during his life. This one is famous for the story behind it. After an incident with another prominent painter of the time, Paul Gauguin, Van Gogh cut off part of his own left year with a razor. He then went to a brothel and told a prostitute named Rachel to ‘guard this object with your life’. This is one of the two self-portraits he painted after the incident. 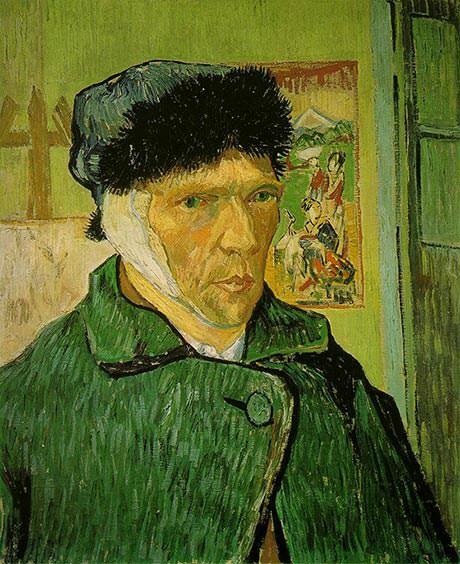 It is to be noted that it was his left ear that was bandaged; it appears right as Van Gogh has used a mirror to paint the portrait. 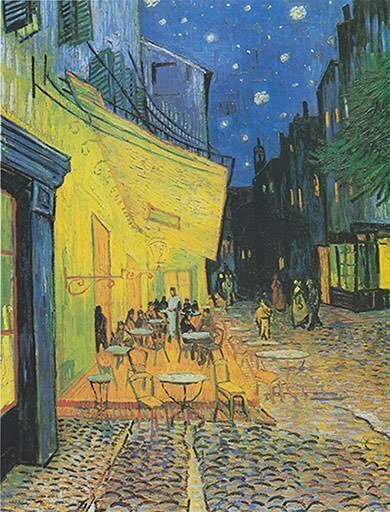 Also known as The Cafe Terrace on the Place du Forum, this was the first painting in which the artist used starry background. Visitors can still stand at the northeastern corner of the Place du Forum and view the scene depicted by Van Gogh. Cafe Terrace at Night remains one of the most analyzed paintings by Van Gogh and it is debated whether it is an innovative depiction of Last Supper. There are several references to the painting in popular culture and a cafe in Croatia was redesigned to look like the cafe in the painting. 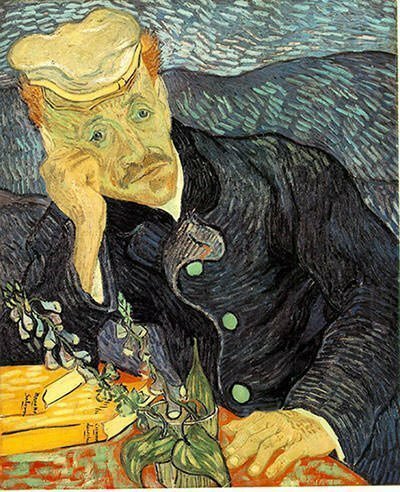 Paul-Ferdinand Gachet was a French physician who treated Van Gogh during the last months of his life. This portrait of him is one of the most revered paintings by Van Gogh. There are two versions of the portrait and this is the first version. On May 15, 1990, it was sold for US$82.5 million making it the most expensive painting ever sold. To date it remains the highest price paid for art at a public auction. On the inflation adjusted list of most expensive paintings ever sold, Portrait of Dr. Gachet ranks sixth to this day. Among Van Gogh’s most celebrated works are his paintings and prints of Irises and this painting is the most famous among them. 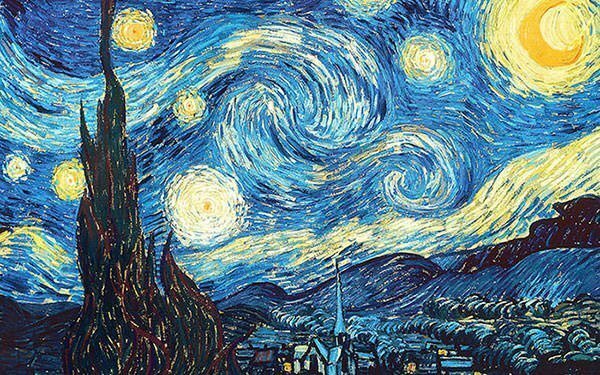 Vincent painted it in the year before his death and referred to as the “the lightning conductor for my illness” as he felt his work was his hope against becoming insane. 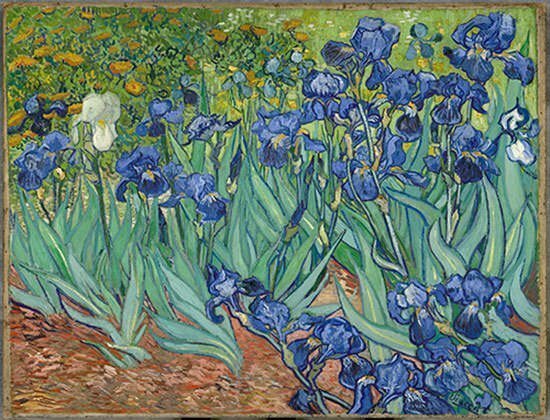 In September 1987, Irises was sold for $53.9 million making it the most expensive painting ever sold. Its record stood for about two and a half years and as of today it ranks 15 in the list of most expensive paintings ever sold if you adjust for inflation. 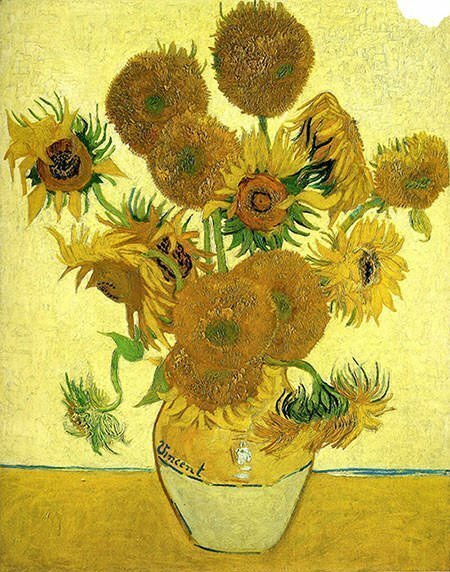 Vincent Van Gogh is considered a master of still life paintings and his series of paintings on ‘sunflowers’ rank among the most famous still life paintings ever created. The paintings are well known for depicting the natural beauty of the flowers and for their vibrant colors. The above painting which is titled Vase with Fifteen Sunflowers smashed the auction record for a painting when it was sold to a Japanese investor for almost $40 million in March 1987. The record was broken two years later by Van Gogh’s Irises. Although painted from memory, this masterpiece depicts the view outside Van Gogh’s sanitarium room window at Saint-Remy-de-Provence in France. The work shows the artist’s interest in astronomy and a study made by the Griffith Park Observatory demonstrated that Vincent represented the Moon, Venus, and several stars in the exact position they occupied that clear night. The painting is considered among the greatest works in western art and is definitely the most famous work of Vincent Van Gogh. Truly a great master of our time! I was able to find two volumes of the complete work of Vincent. I am an artist and I love to sit and look at his work. Amazing. These two volumes reproduce the colors so well. Wonderful collection Anirudh…..appreciation from another Anirudh who appreciate art and is a hobbyist artist. Van Gogh and Dali have always inspired us will continue to do for the future generations. Hi there Anirudh! Thanks a lot for your appreciation. The mystery and beauty in, and beyond Vincent Van Gogh, is the fountain of divine inspiration and creation of one of the best artists of all times! This question can be understood and lived only with a extremely loft heart-mind. Thank you for honoring him through your appreciation! I am not a great art expert, but I seem to understand Vincent Van Gogh better than other artists. For me this is why he is so wonderful. If a guy like me can understand this art so easily, it must be because of the artist. Awesome.